Characterised by its stillness amidst profound pain, Still Time is a poignant story about loss. Within brokenness we find a counterintuitive sense of unity. This is a novel built around seemingly disparate stories yet united together in powerful ways as Hegland conveys to us, through the eyes of John, the distressing, isolating, and confusing experience of dementia. Like John, we struggle to pin together the pieces of the narrative until the peroration which sees a union as powerful as that we wish for, for Lear and Cordelia, and the union we are offered at the close of The Tempest, The Winter’s Tale, and even Pericles. Like the late plays, a powerful sea-change also occurs in this novel. John’s Daughter, Miranda is a character who ultimately shows herself to be at least as powerful in ensuring unity as her Shakespearean character namesake. (Even if the odds are rarely stacked in her favour). But you might be wondering why this novel is appearing on a Shakespeare site at all. That’s the really clever part of the novel. This consideration of the human capacity to remember is woven into the story of John Wilson, a retired Shakespeare scholar. Falling in love with Romeo and Juliet as a student, John began to memorise lines and whole plays by Shakespeare. Shakespeare dominated his working life, as he devoted himself to the study and exposition of Shakespeare’s plays to students and fellow scholars alike. But as his memory fades, Shakespeare remains: first the memories of scholarly criticism, later the stories, and finally merely ‘words, words, words’. Shakespeare’s words speak when John cannot. He marvels yet again how perfectly the lines William Shakespeare wrote four centuries earlier […] fit what John is feeling now, as a man of seventy, half a world and four centuries distant.. The quiet stillness and peace of Still Time is in contrast to the increasing fragmentation which the narrative mimetically reminds us of. But there is a bigger contrast: while you might expect a still, calm, and peaceful novel to be a slow – dare I say it, boring – read, the reverse is true of this book. I found myself gripped to John’s story. The peace of the narrative masks the pain below, and the stillness is constantly rocked by the crumbling consciousness of John Wilson. This is a novel which will resonate for Shakespeare enthusiasts, academics, and those with only a school knowledge of Shakespeare for above all it is a story of a journey of memory – of what remains when all is lost. Read it and experience the power of words once more, as love and Shakespeare bind audience and characters together in perfect harmony. 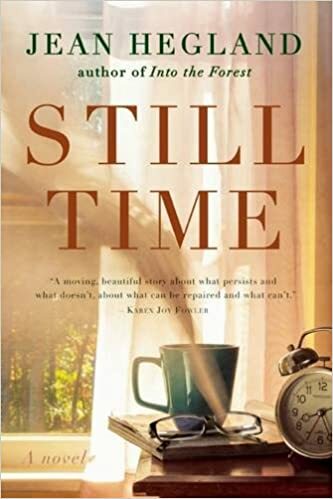 Like Christmas films which end with family reconciliation, Still Time is a heart-warming novel and yet the slippage in memory and words gives the tale of John all the more power amidst the poignancy. Miranda urges her father, as a child not to remember, as that suggests forgetfulness but to ‘member’ and, as we follow John’s journey we member the power of words and memory to damage and destroy, but also to renew and reconcile when all is seemingly lost. By articulating the story of John Wilson, Hegland offers us a vivid depiction of the experience of dementia. She also closely captures the story of the academic journey from student to professor, as we see the student become the master, and ultimately a reversal to student fascination with mere words at the novel’s close. The limitations of academic study are shown by the re-visioning of John’s astute-though-confused eyes as he reforms and refashions Shakespeare’s words again as if for the first time. Though memory shatters, Shakespeare’s words still remain. Like Shakespeare’s sonnets where time is transcended, so too in Still Time are the memories of John memorialised. And the chocked cry of each reader as Still Time ends will be ‘Goodbye, Goodbye’, as John wordlessly urges us to “’member me”. Fun at the Folger, part 1: What IS the Folger?